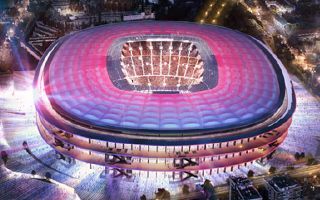 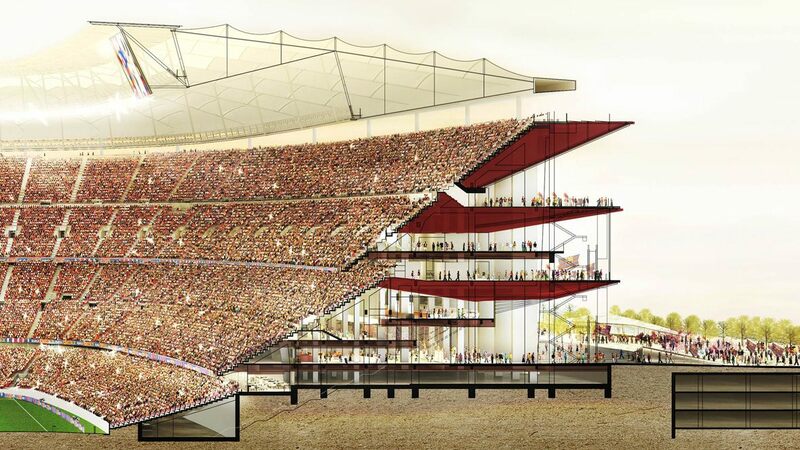 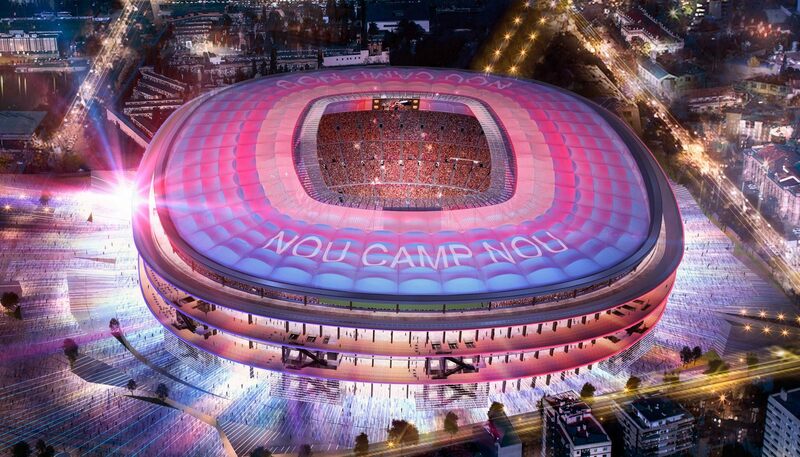 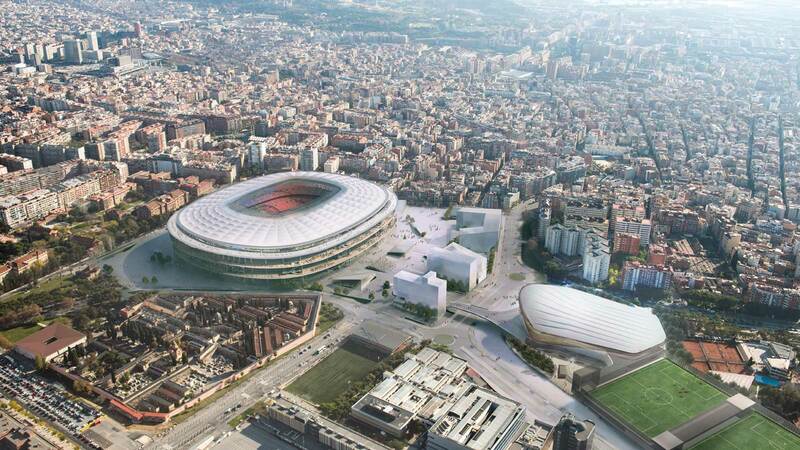 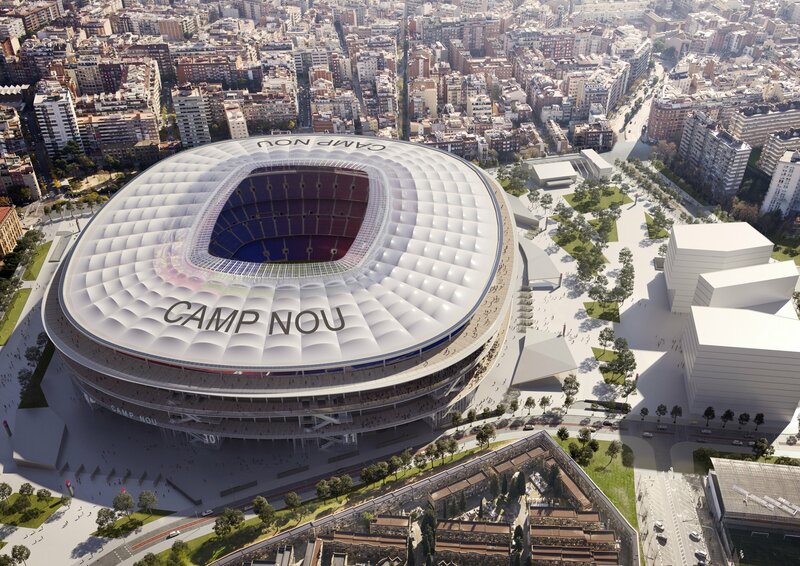 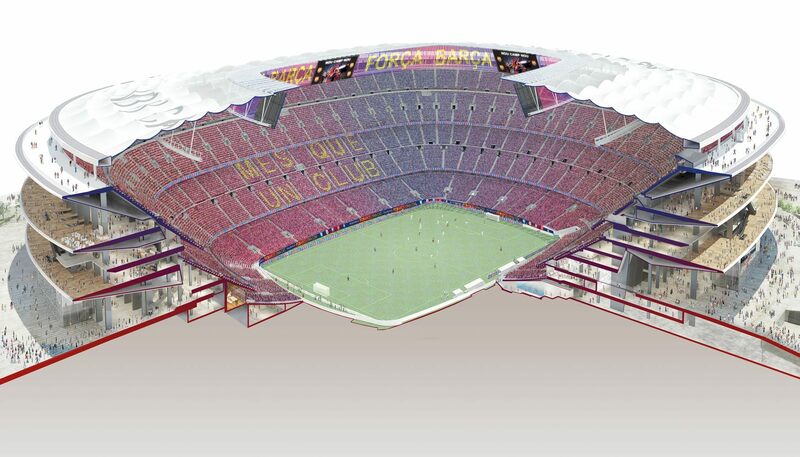 The winning bid for Camp Nou’s reconstruction is fundamentally different from the one selected in 2007. 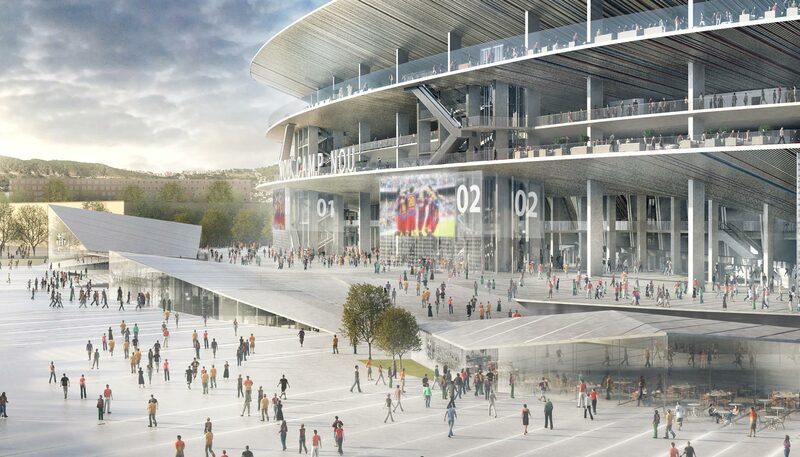 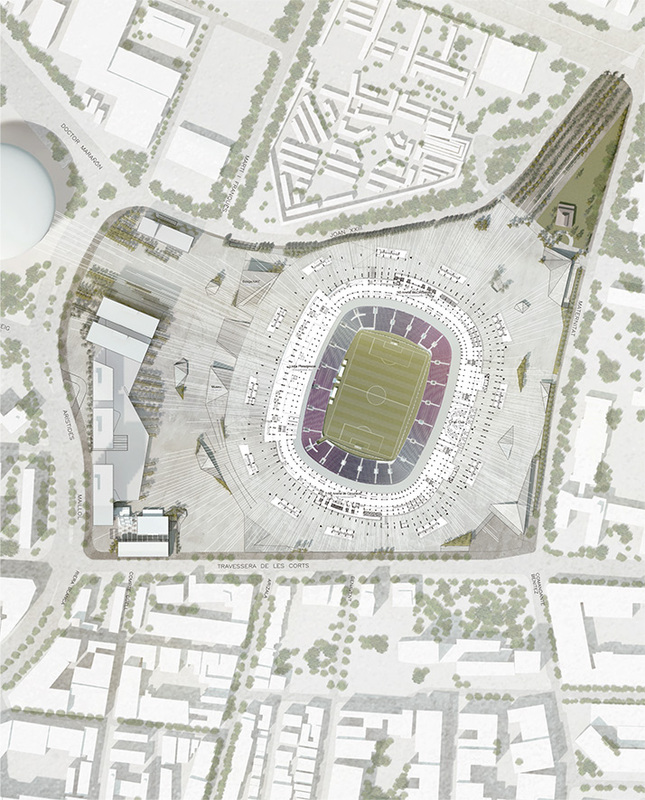 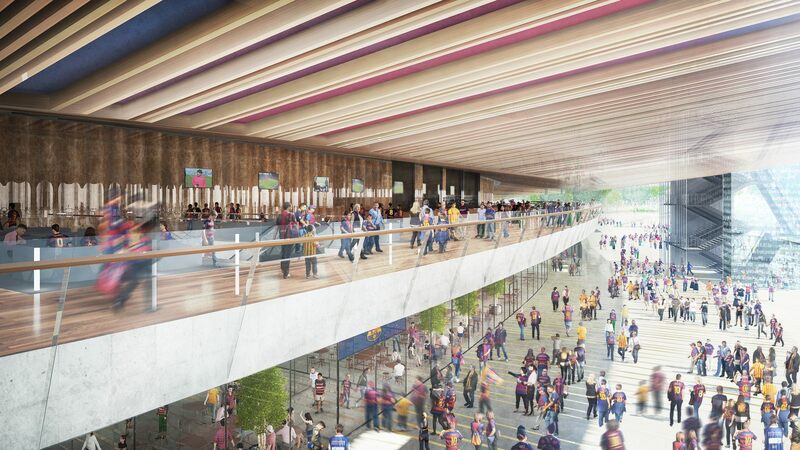 Instead of an enclosed bowl FC Barcelona opted for a maximally open layout with nothing standing between fans on the three promenades around the stadium (first one being the ground level) and outer surroundings. 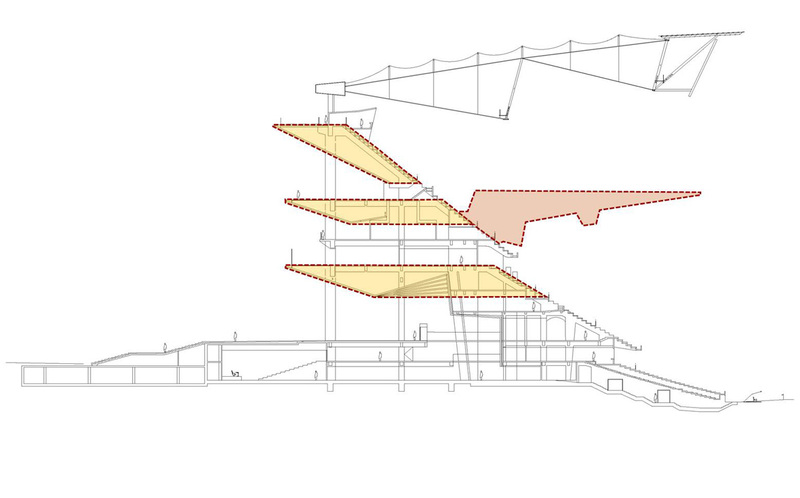 The defining aesthetic feature are three ceilings for each promenade, slanted and highly visible from pedestrian perspective. 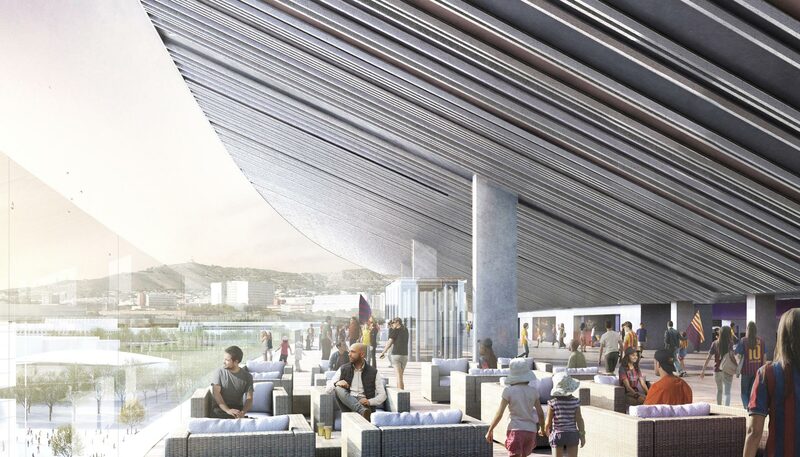 Nikken Sekkei and Pascual i Ausió created a simple, subtle and timeless space that will utilize natural ventilation and shading to provide comfort to spectators in this Mediterranean venue. 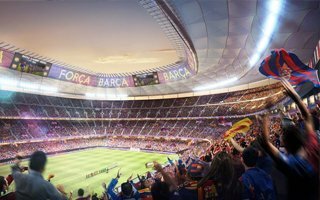 As the stadium is set to grow to 105,000, seating layout will change noticeably and along with it so will all access routes. 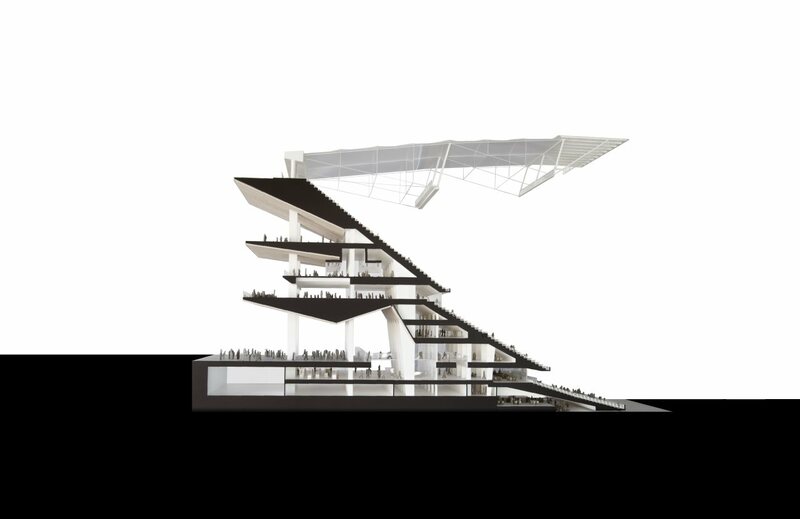 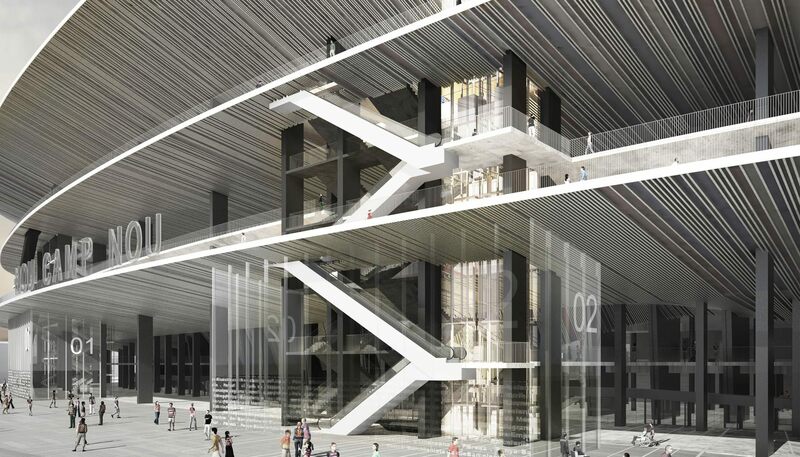 Notable addition: unprecedented number of escalators. The seating layout is thought to deliver optimal sight lines to all fans, spreading them on 84 rows (25 in the lower tier, below ground level, 31 in the middle and 28 in the upper tier). 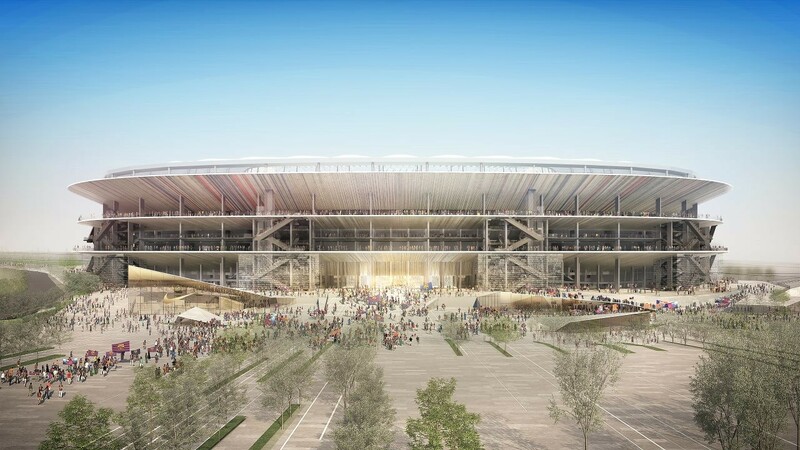 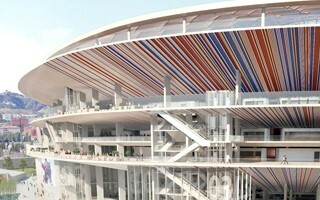 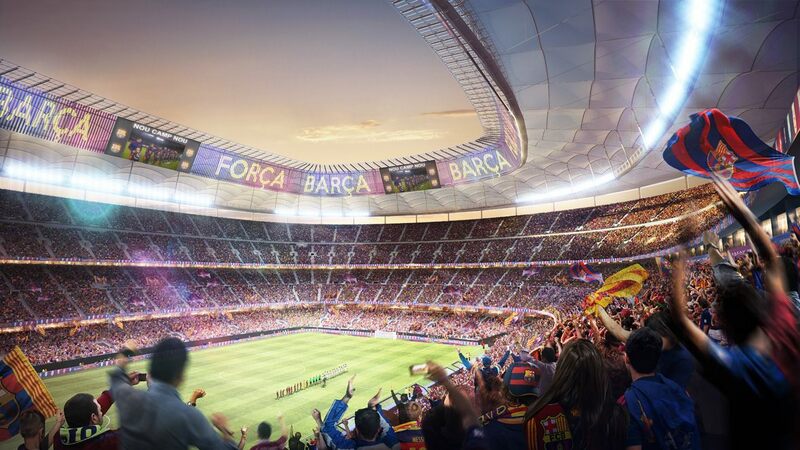 All of the stadium will be covered by 47,000 square meters of membrane. 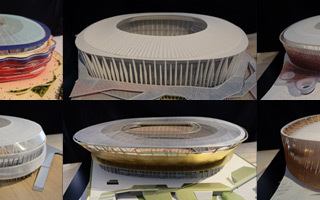 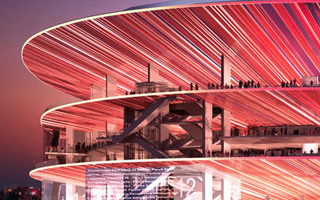 The concept was selected in a two-level competition. 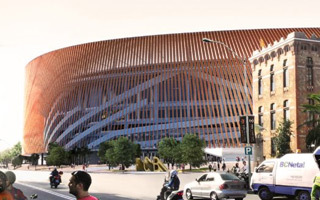 First, 26 teams of architects filed their bids in mid-2015. 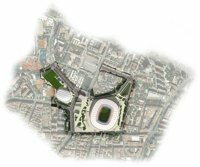 Then a technical committee shortlisted 8 of them, assuring that each international office had a Spanish/Catalan partner. 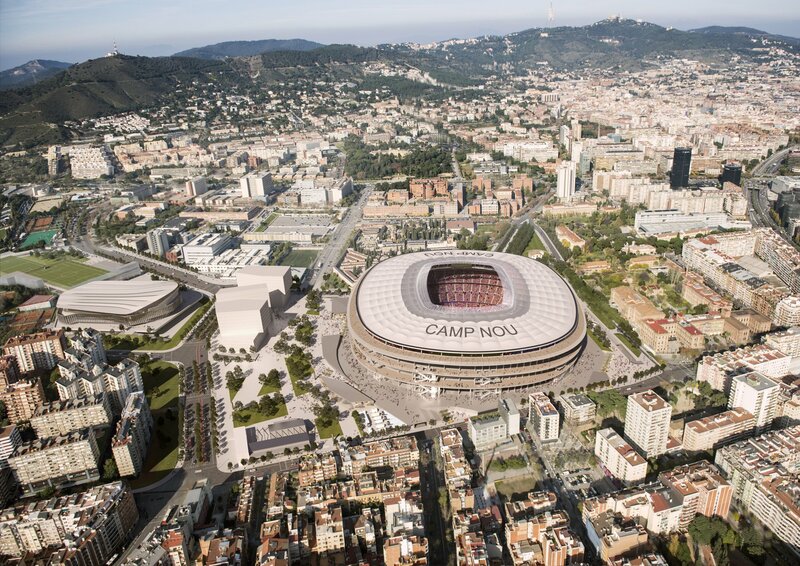 Finally a jury of 10 members (5 for FCB, 4 for Catalan College of Architects and 1 for the City Council) chose the winner on March 8, 2016. 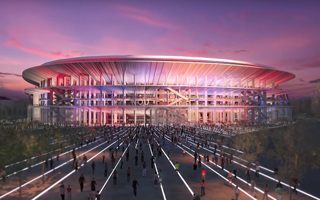 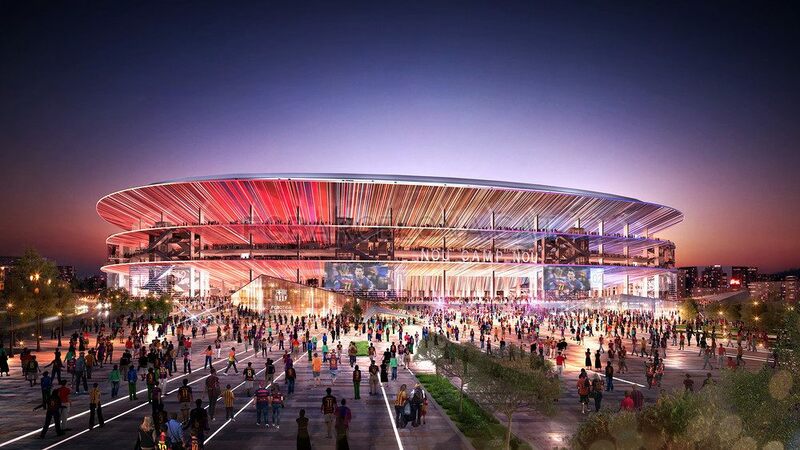 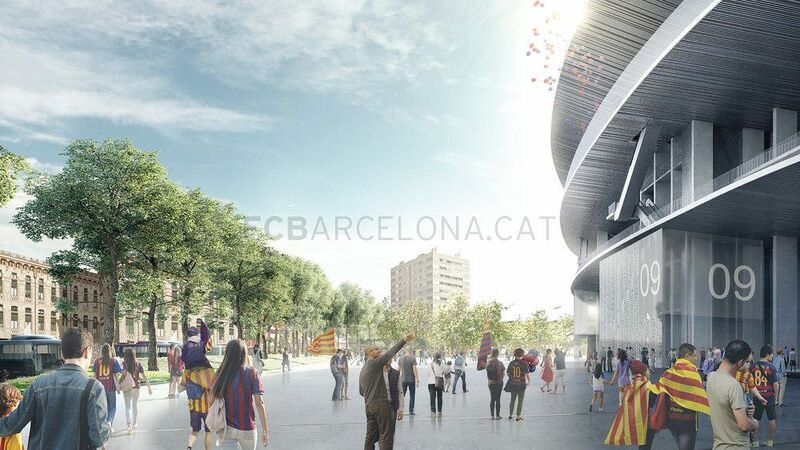 Reconstruction was set to begin during the 2017/18 season and end in 2020/21, however the project encountered numerous delays. 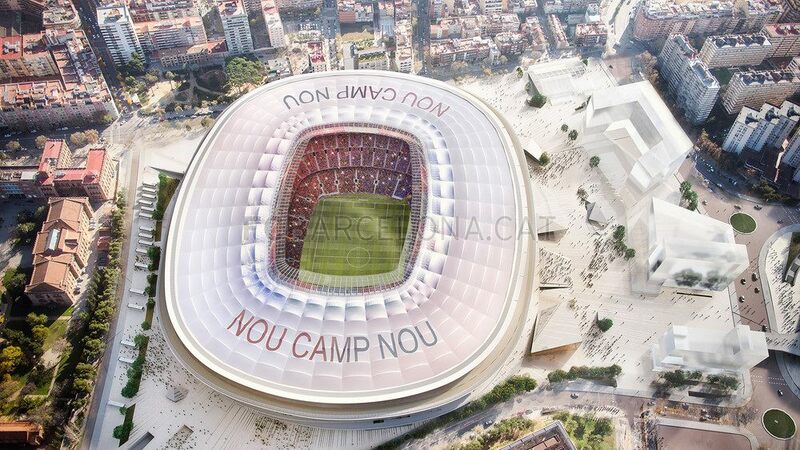 Well, almost. 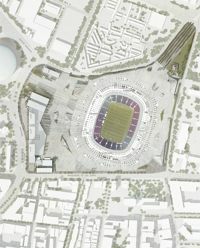 We're still waiting for the city council to make it official, but agreement has been reached between the city and club. 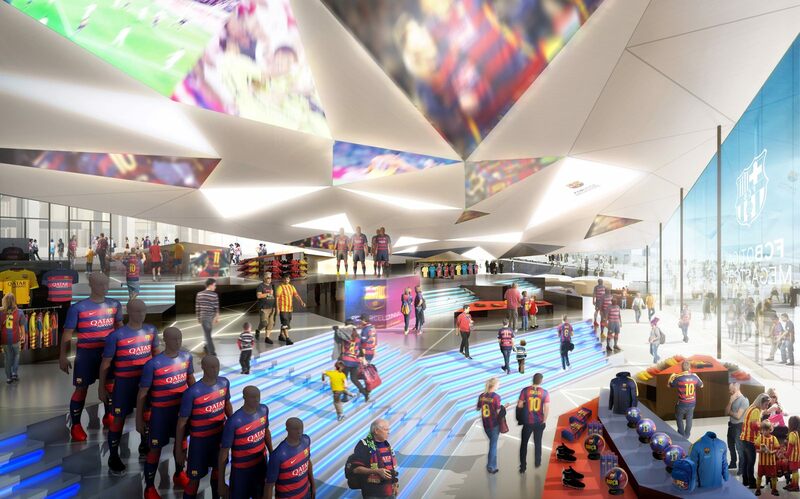 Reconstruction should begin next year. 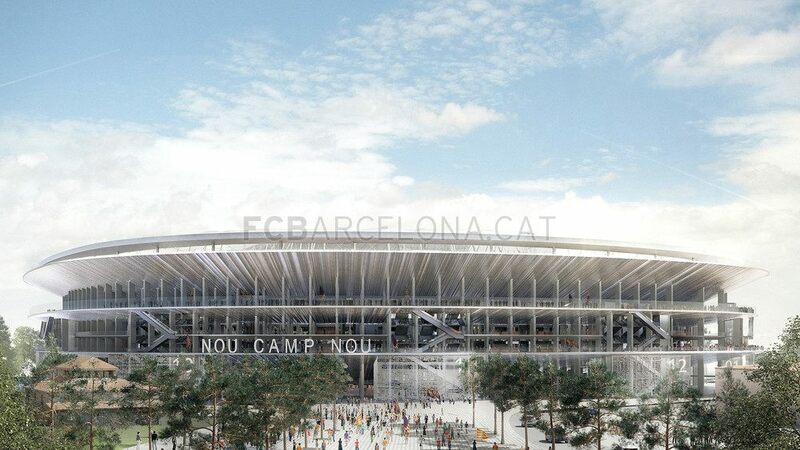 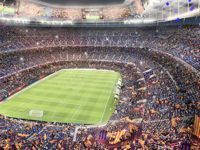 06.04.2018 Barcelona: New Camp Nou – when, exactly? 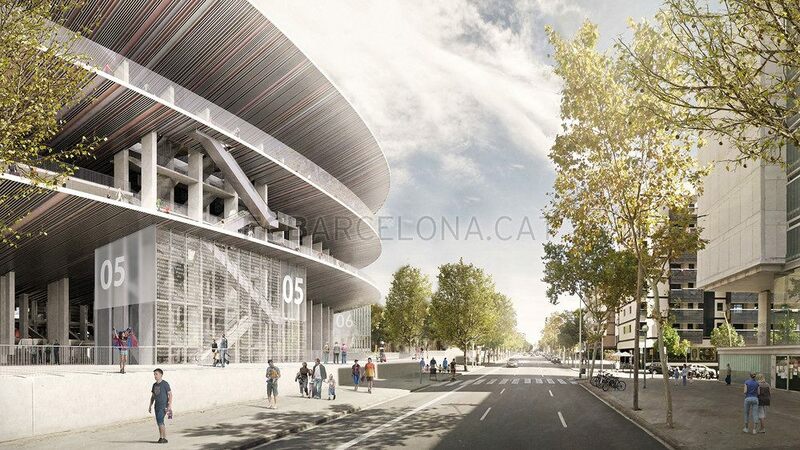 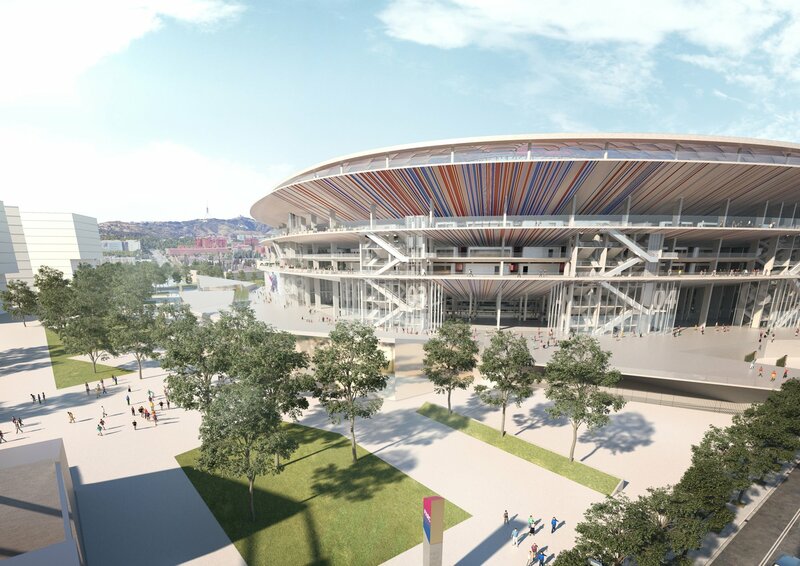 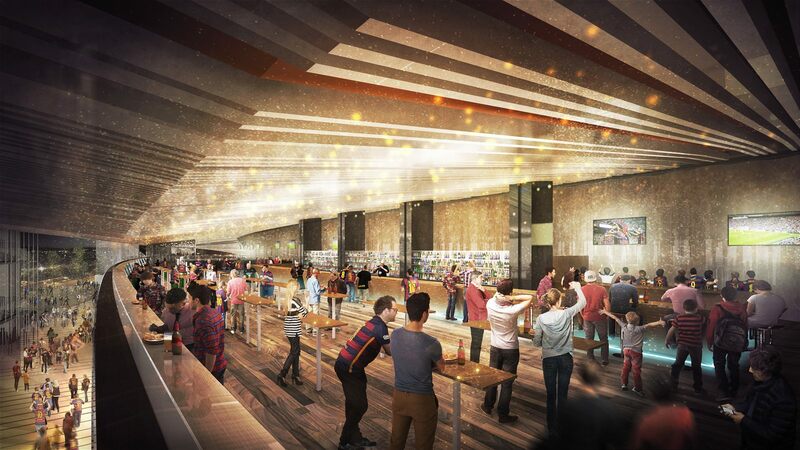 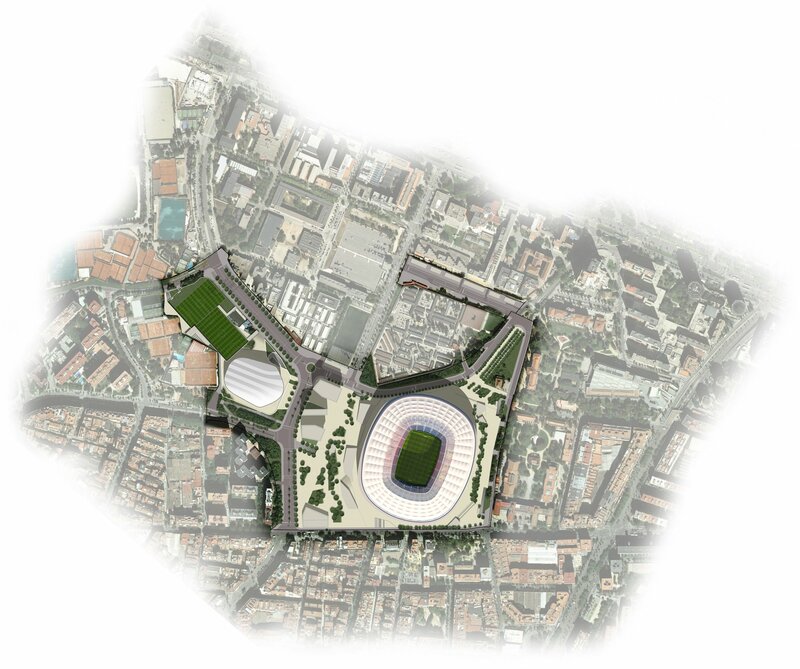 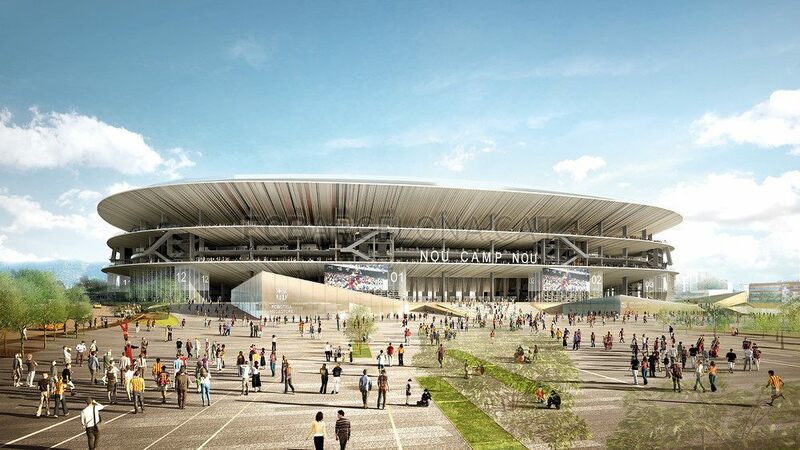 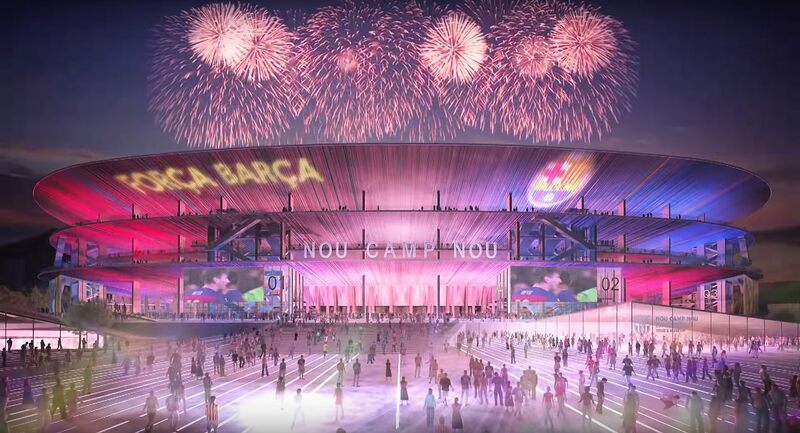 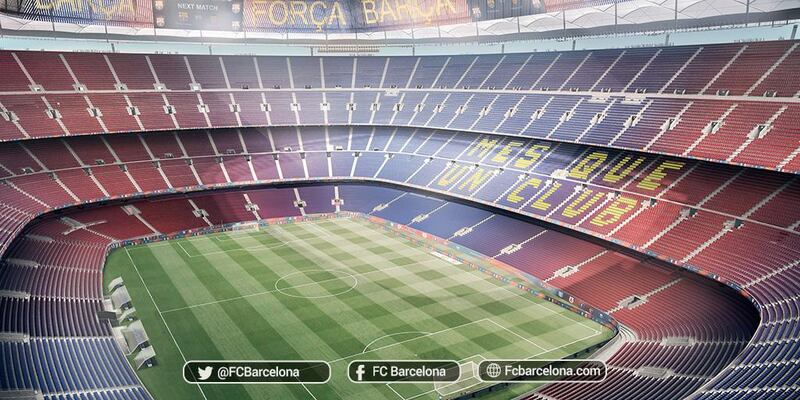 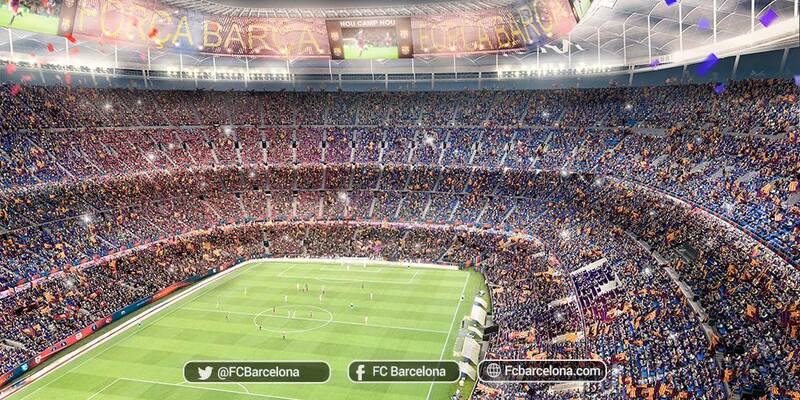 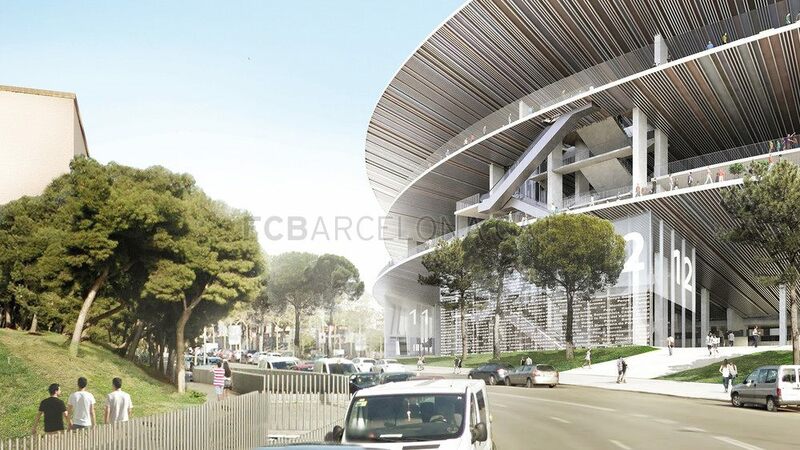 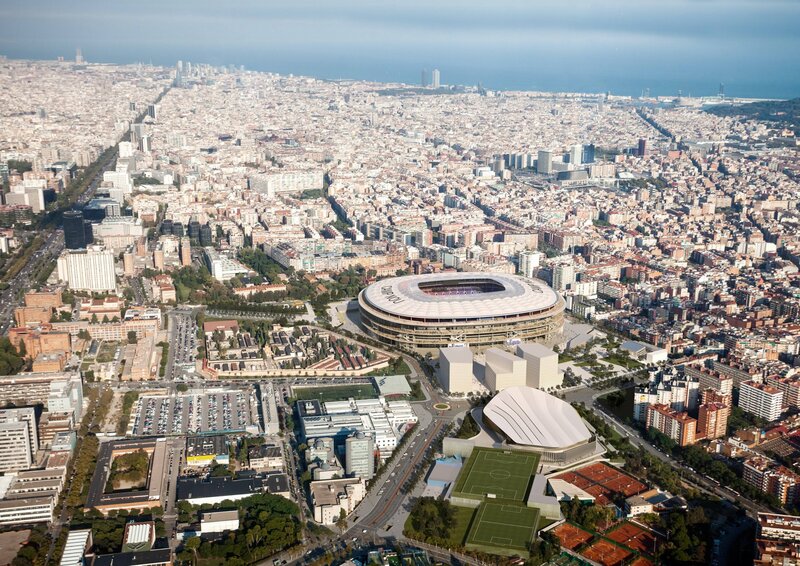 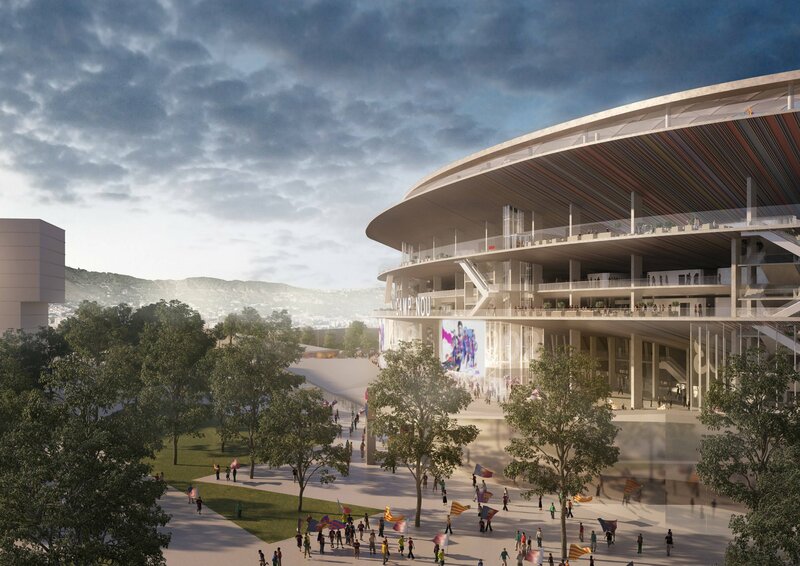 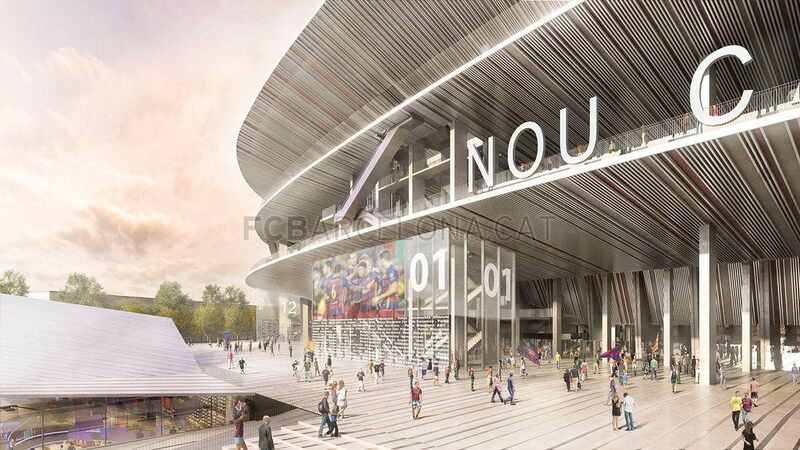 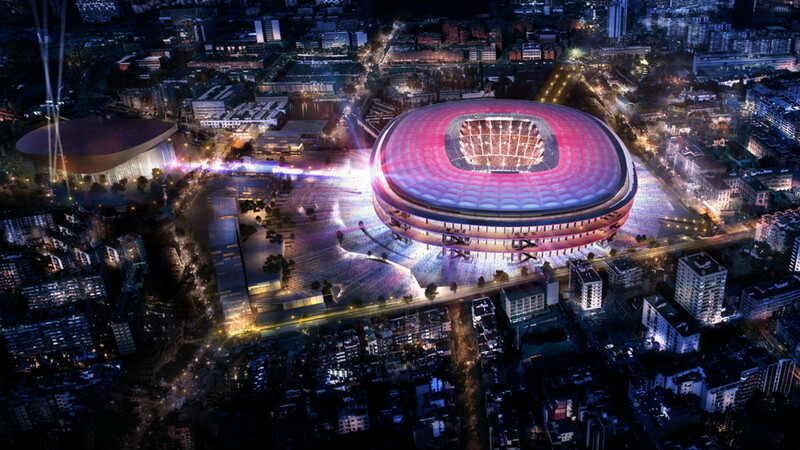 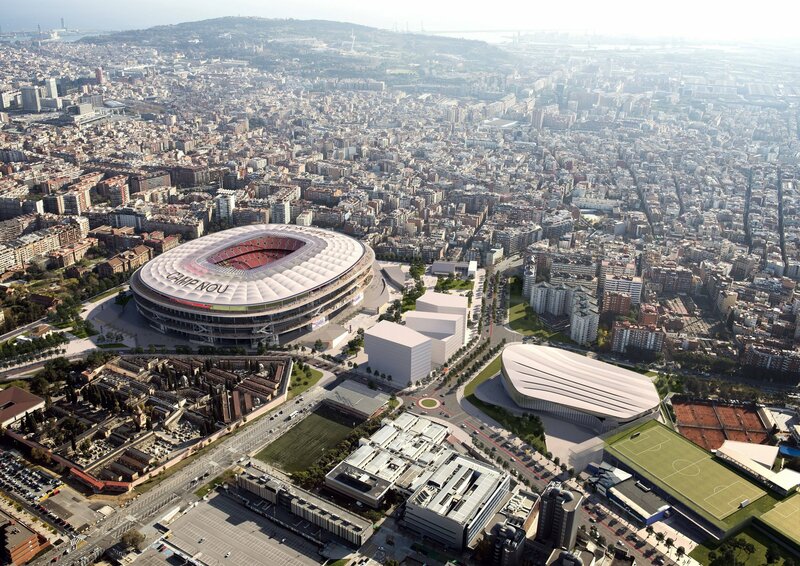 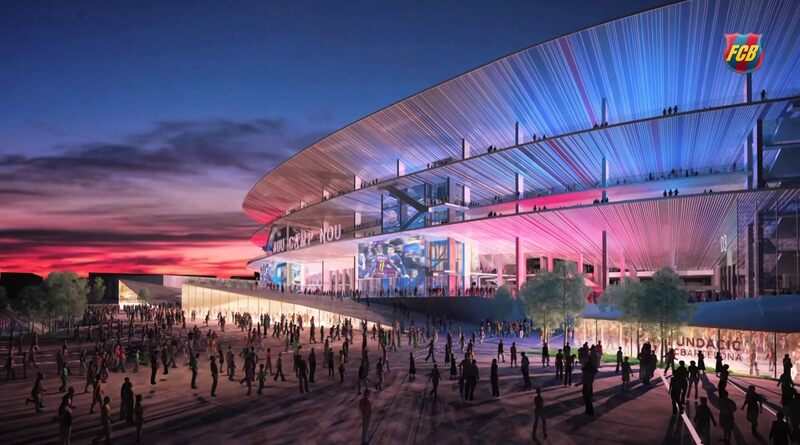 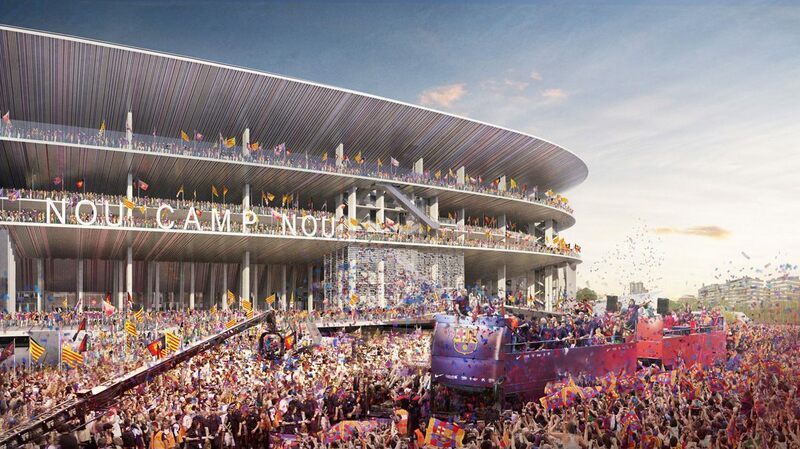 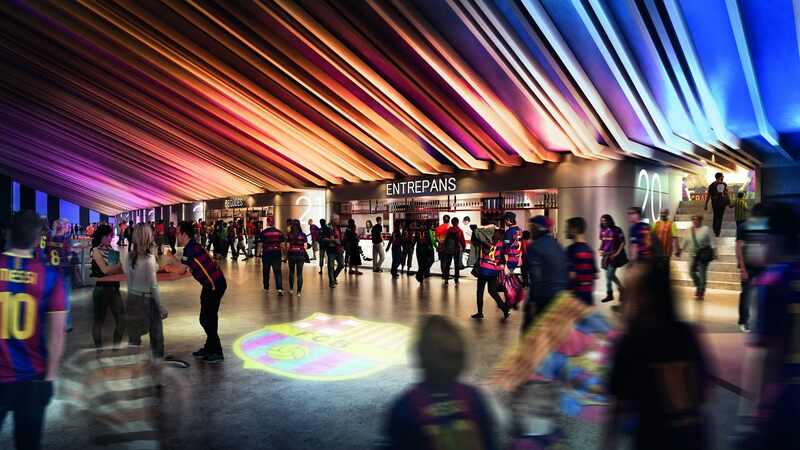 It's been four years since socis of Barcelona approved the massive redevelopment of Camp Nou. 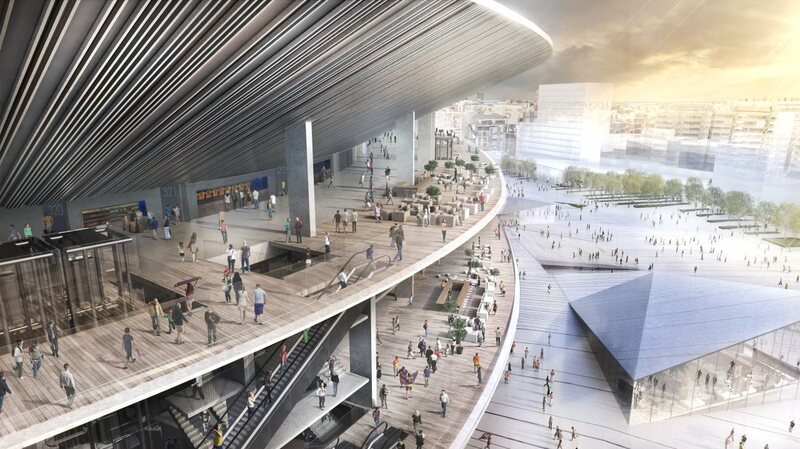 And yet not even one shovel was moved on site. 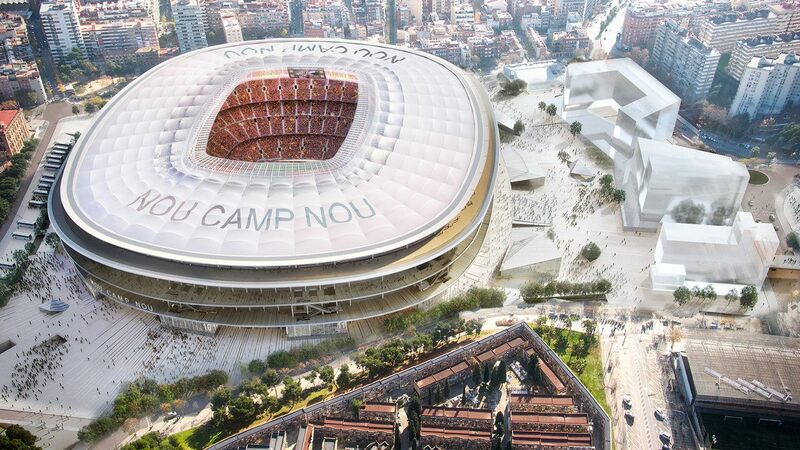 From 2021 the delivery date moved to 2023 and it might end up even later.